Kidz Village is an enchanting indoor playground and fun center! 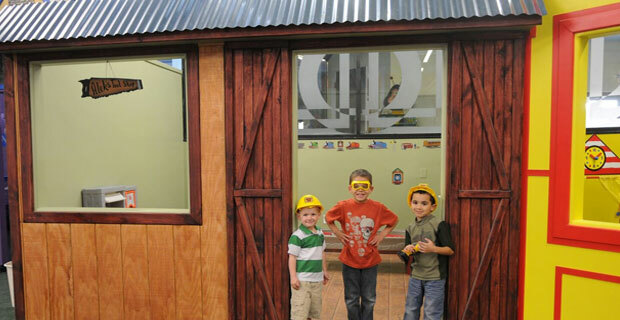 Kidz Village is an enchanting indoor playground and fun center where kids ages 10 and under play, interact, and explore. We offer a fun variety of themed play rooms within a kid-sized town, like a 50’s style diner, grocery store, beauty salon, tool shop and castle, just to name a few. Kids love to play, jump, and climb in our huge multi-level playground. Let them test their skills on our arcade area, and explore through a village made just for their size. With endless entertainment, Kidz Village is truly a one of a kind fun center with a price that can’t be beat, as well. There’s no better place for your child’s imagination to grow and for them to meet new friends their age. With unlimited play time Kidz Village is perfect for young children with plenty of energy. Open 7 days a week Sunday-Thursday 10am-7pm and Friday-Saturday 10am-9pm. We have open play all day, everyday! Kidz Village has the best birthday parties! We offer personalized interactive parties in private party rooms. Our professional party hosts have been extremely trained with most having over 5 years experience throwing hundreds of parties. We keep your adult guest happy too with our large selection of food choices, including vegetarian options. The best part is you and your guest are welcome to stay welcome to stay and play as long as you like after the official party time. All this makes for the perfect party experience!